Living in a large city, it’s not every day a neighbor gives you freshly laid eggs (thanks, JLP), so when one does, it is a special occasion to be sure. Not only can you be certain the eggs will taste better than anything you would find at the store, you can also take comfort knowing the chickens were properly cared for and fed. Thus for me, receiving such a gift imparted a duty to lavish special attention on these eggs when it came time to cook them. I immediately fried up a few over easy and once I had dredged my plate clean with toast, I knew I needed to make something that would let me enjoy what remained for as long as possible. The answer was egg cups. Egg cups are yet another breakfast invention that welcome creativity because of how many ways they can be cooked, filled and stored. I had some fresh mushrooms, a packet of crumbled feta and some leftover frozen broccoli to use up and so that is what is in this version. I probably wouldn’t even buy ingredients, rather, just look in the fridge and see what needs using. You could put in cold cuts or leftover cooked sausage. Stick with just the egg and milk mixture, but add fresh or dried herbs. Have a few almost-gone bags of shredded cheese? Mix them together and sprinkle on top. The sky’s the limit, with perhaps one exception, it definitely pays to cook the ingredients you mix in first. Raw veggies tend to give off too much water, making for a soggy cup. Raw meat would take too long to bake to its proper temperature, and trust me, you do not want to over-bake these, as you’ll be soaking and scrubbing your muffin tins for hours if you do. But once they’re baked, these egg cups keep for days in the fridge or can be frozen and microwaved later for a quick meal or snack. I like to make a batch on Sundays to have for breakfast all week long, 2-3 with some fruit and/or bread is a great way to start the day. They are wonderful between two halves of a toasted english muffin too! But you get the idea, give ’em a try, play around to make them your own, and most of all, enjoy! Melt the butter in a skillet over medium heat, add the mushrooms, broccoli and garlic powder, as well as a pinch of salt (this will help draw excess moisture out of the mushrooms). Cook about 10 minutes until the mushrooms and broccoli are tender, and there is little liquid in the pan. Set the pan aside to allow the ingredients to cool (I often transfer the veggies to another bowl and place it in the fridge to help speed the cooling along). Preheat the oven to 350 degrees and coat two 12-count, non-stick muffin tins with cooking spray. In a medium bowl, beat the eggs and then mix in the milk, salt and pepper. Next, spoon a heaping tablespoon of the cooled veggie mixture into the bottom of each cup. Then top with 2-3 tablespoons of the egg mixture. Sprinkle with a few feta crumbles. You should get 18-24 depending on how full you make each one. Bake for about 15 minutes or until the eggs are set. 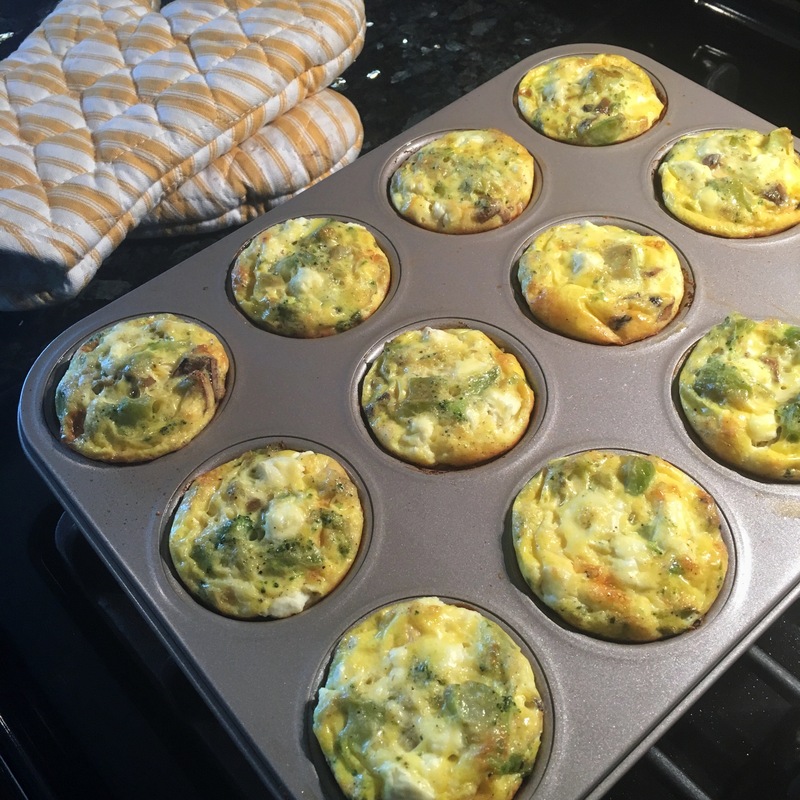 Let cool a few minutes before gently removing the cups from the muffin tin to serve and nosh. If making now to enjoy later, let cool on a wire rack, then refrigerate (or freeze) in an airtight container until ready to nosh. You can enjoy them cold, or microwave for about a minute until hot (I sometimes cover them with a damp paper towel while microwaving to help retain moisture, but it’s not necessary). Let's explore food's different personalities together.